Paradise is a stunning, modern and professional WordPress theme. It is orientated to beauty services business like massage, nail, tattoo, barbershop, hair salon and spa salon in the most appealing way. You will get it with 10+ elegant and bright homepage alternatives to select from. Paradise offers lots of pre-built options such as moveable sidebars and headers. It has unlimited layouts easy to set up in both boxed and fullwidth formats. You will also get unlimited colors and fonts options to customize at will. Paradise is retina ready and versatile to say the least. You will get it with powerful shortcodes provided by Bootstrap framework. Page builder is no less than Visual Composer. Set multi-vendor, buyers and product pages easily. Paradise features specialized plugins like Booked and WooCommerce for appointments and payments respectively. It is a 100% responsive theme that is optimized for speed. You will be able to use it with all kind of browsers and devices. Paradise brings you multiple navigation options and comes with a footer that can be adjust up to 4 columns. Several awesome compatibilities include WPML for translation. This is a theme made with care and clear business orientation! Show what your business has got to offer! Download its awesome demos right away! Paradise, a worthy to buy Wordpress theme, don’t miss out. All of the beautiful pre-made , homepages, demos, templates and page setups you can see here in the Live Preview, are ready to be yours at the simple click of a button. Purchase your copy today, download the installation package and one-click installer guide you through the rest of the setup. Paradise is a WordPress theme especially designed for self care and spa salons. It comes with outstanding specialized features like multi-vendor plugins. It is made with HTML5 and CSS3 design and coding. Programming skills are not required! Paradise uses Booking Calendar plug-in so it’s easy for users to make events and appointments. It also includes multiple layouts to show your services, costs, contact and such. Paradise comes with 6 different homepage layouts and 5 header styles. Choose the one that suits your business and play with customizations. It has unlimited colors and color schemes with advanced panel options. Paradise provides a CSS field, to transform elements to match your unique preferences. It was built with Bootstrap and thus includes all its flexible shortcodes. A child theme will also be included to expand yourself. Paradise was optimized for both speed and SEO. It is also compatible with all kind of browsers and devices’ screens. Download its demo and get set up with a one click import! You can get your website ready in minutes. It has premium support, regular updates and well detailed documentation. Get new clients and expand your business. Create your reliable platform to show, sell and manage your services! Try Paradise! Backup & Demo Content – automated backup schedule, import demo content or even create a demo content archive for migration purposes. Booked plugin – payments with WooCommerce, Front-End Agents, Calendar Feeds. Paradise Child Theme – Customize or tweak an existing WordPress theme without losing the ability to upgrade Paradise theme. Built on Twitter Bootstrap – Paradise uses Twitter Bootstrap. This means that a range of shortcodes are automatically supported. For ease of use you can use the Visual Composer, Easy Bootstrap Shortcode or any other plugins to easily add visuals to your website. Header stick – Sticky Header is a godsend for those people who are tired of scrolling up from the bottom of the webpage to select an other menu item. Paradise’s main menu with logo will be following when you scroll and always be at the top of the screen. Now the viewers of your site will be thankful for the fast and easy navigation. And of course, this sticky header feature can be easily enabled/disabled in options panel of your theme. Availability of the author to answer questions. Answering technical questions about item’s features. Assistance with reported bugs and issues. Help with included 3rd party assets. If you have any questions about customization of this template, which are not covered in the documentation feel free to ask a question in Support Center . We really care about customer support services and guarantee to response to all support topics within 24 hours on weekday (a bit longer over weekend). Please, feel free to post technical pre-sale questions directly to our Facebook message. Save time and headaches. An installation service will setup your theme for free. Please, open a ticket to support center. We will be glad to assist you. # Tested up to 5.1.x. # Compatible with WooCommerce 3.5.x. # Updated: 04 New Homepages (Spa, Nail, Tattoo, Barbershop). # Fixed: Not showing footer. # Updated: .pot file language. # Fixed: Error menu on mobile & IOS. # Fixed: small bugs and improve performance. # Updated One Click Import Demo. Check out the review of the Paradise – Multipurpose Beauty & Spa, Haircut, Nail, Tattoo Wordpress Theme. How many languages does the Paradise – Multipurpose Beauty & Spa, Haircut, Nail, Tattoo Wordpress Theme support? The current theme version is in English, but we are going to include additional languages in future theme updates. Nevertheless, the theme can be easily translated; it includes the needed PO files which can be translated to any other language using plugins like LocoTranslate. Can I build a website that uses your Paradise – Multipurpose Beauty & Spa, Haircut, Nail, Tattoo Wordpress Theme and works with several languages? You can easily add a multilingual feature to your website using a plugin like WPML. This is the best solution for multilingual websites, so we made sure that the Paradise – Multipurpose Beauty & Spa, Haircut, Nail, Tattoo Wordpress Theme is 100% compatible with WPML. Can I use the purchased theme on several websites? Due to the single license policy, a purchased theme can be used on a single website. 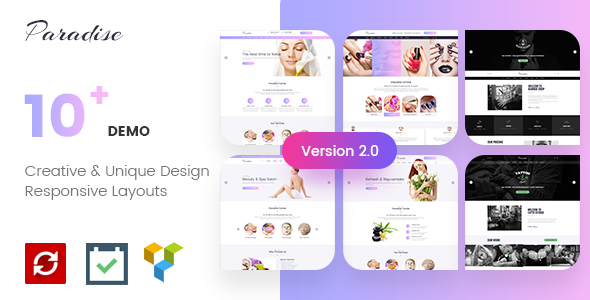 You will need to purchase the Paradise – Multipurpose Beauty & Spa, Haircut, Nail, Tattoo Wordpress Theme again if you want to use it on another website. What is the best php version to use with Paradise – Multipurpose Beauty & Spa, Haircut, Nail, Tattoo Wordpress Theme? This theme requires PHP version of at least 5.4.x, but we recommend version 5.4.x or even better 7.x. Please contact your hosting company and ask them to update the PHP version for your site. Are the colors customizable on every field? You can easily customize the colors, making the theme fit your project and business’ color scheme. A custom CSS field is also included, allowing you to alter any specific element, and thus make it match your specific preferences. Do you provide free install service of your Paradise – Multipurpose Beauty & Spa, Haircut, Nail, Tattoo Wordpress Theme? Yes, we provide a free service install demo data for you. After buy theme, you can open the ticket to our support center or open the topic to our community forums. We will check and import demo data. Do you provide customizations of your Paradise – Multipurpose Beauty & Spa, Haircut, Nail, Tattoo Wordpress Theme? We do not provide theme customizations. However, we offer support for our products, so we will fix any bugs, errors, etc. You can always hire a programmer if you want to customize the theme for your needs, of course. I have submitted a ticket on Saturday night. It’s Monday now, and I haven’t received a reply yet. How long should I wait? Our business hours are always posted at our tech support forum, so please make sure to check them. We really care about customer support services and guarantee to response to all support topics within 24 hours on weekday (a bit longer over weekend). Purchase now and get free installation! For each purchase, customer will get free install service worth $50. Just open a topic with your purchase code & provide us WordPress admin information.